TUESDAY, Jan. 23, 2018 (HealthDay News) — Potential harms and benefits of e-cigarettes may depend on your age, according to a report mandated by the U.S. Congress. To shed light on e-cigarettes’ (or vaping’s) impact, Eaton’s team constructed several population models to project future consequences. In the short term, over the next 30 years, e-cigarettes are likely to be a public health benefit, the researchers determined. That’s “because even a small smoking cessation rate among adult smokers can have a public health impact,” Eaton said. But the effects on children who start smoking tobacco because of e-cigarettes won’t be seen for many years. Looking over the next 50 years, e-cigarettes may have a negative public health impact, he added. Intake of nicotine — the addictive component in cigarettes — can be comparable in e-cigarettes and tobacco cigarettes, the findings showed. However, e-cigarettes contain fewer toxic chemicals, and lower levels of them, than traditional cigarettes. 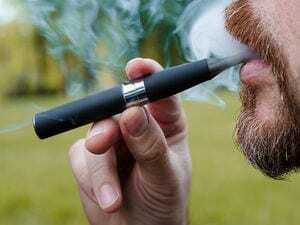 Switching to e-cigarettes from regular cigarettes can reduce short-term negative health effects “in several organ systems,” the authors of the report noted. However, there is “substantial evidence” that e-cigarette use by teens increases their risk of smoking tobacco. “The committee’s findings fall in line with FDA Director Scott Gottlieb’s nicotine strategy, a key element of which involves adult smokers switching to lower-risk products,” said Conley. “The report confirms a number of concerns that public health advocates have with regard to e-cigarettes,” said Sward, the association’s assistant vice president for national advocacy. These findings highlight why FDA oversight of these products is important, Sward said. “This could very well be damaging, particularly in terms of impacting kids,” she said.